The Russian president has ordered energy giant Gazprom to recover Ukraine's $US 2.4 billion debt for natural gas supplied by the company. The Russian president met with Gazprom CEO Alexei Miller on Thursday and discussed the importance of collecting the debt in full in light of the current global financial crisis and falling price of oil. 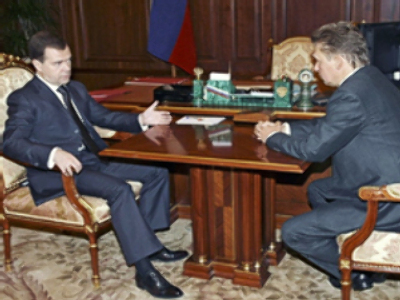 Medvedev asked Miller about the progress of talks for next year. However when the Russian president asked him “where the money was”, Gazprom's chief seemed less than sure that it would be paid. “This debt is astronomical and your question about 'where the money is' is absolutely appropriate. There is no progress in the relations with Ukraine and we are not sure we will get the money back,” he said.